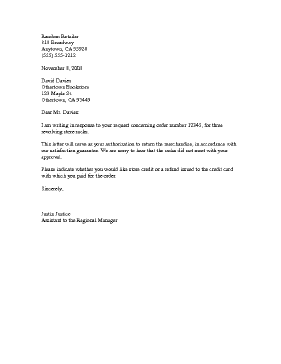 A customizable letter template from a vendor or retailer authorizing a customer to return a product. I am writing in response to your request concerning order number 12345, for three revolving store racks. This letter will serve as your authorization to return the merchandise, in accordance with our satisfaction guarantee. We are sorry to hear that the racks did not meet with your approval. Please indicate whether you would like store credit or a refund issued to the credit card with which you paid for the order.